AIR, conceived for competitors, it is the new top of the line, high-resolution display integrated vario. Its shape is optimized to the maximum strength; his display offers the best visibility also in bright light conditions and his four big operative keys ensure the best accessibility even wearing big gloves. 2) whoever can ask for the installation of the optional GSM-GPRS module needed for the internal Live Tracking, although this is not essential, as the Digifly AIR is equipped with a 4th generation Bluetooth processor able to communicate with every current mobile device, e.g. a smartphone on which you can install, for free, the Live Tracking app XC Soar. AIR is entirely designed, engineered and manufactured in Italy; it uses state of the art processors and sensors, including a 99-channel anti jam GPS unit updated 10 times per second. Air features also a new inertial platform that provides an even more accurate evaluation of the wind direction, improves the sensitivity of the variometer, acts as a G meter for acro pilots and allows to get more precise information from the magnetic compass even at high bank angles of the wing. Five models to suit all pockets. 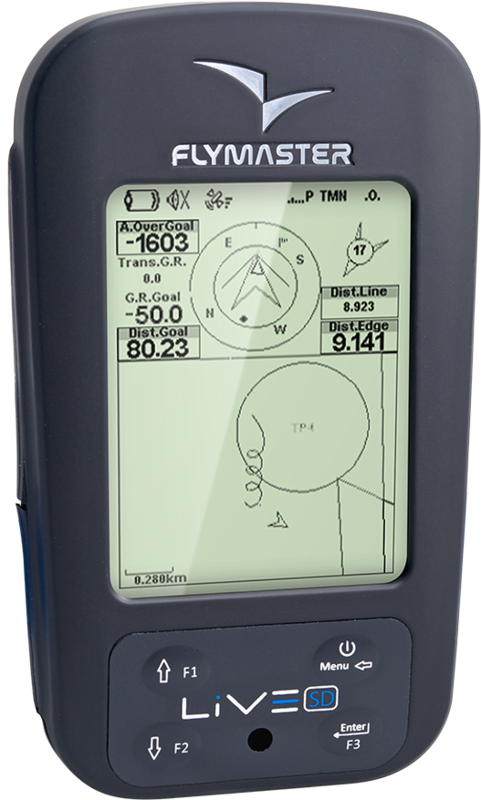 The GPS SD PLUS is the ultimate Flymaster flight instrument for pilots wanting to fly XC and have the proven live tracking functions of the renowned LIVE SD. The LIVE SD is the ultimate Flymaster flight instrument specially built for competition and XC pilots. It has all the bells and whistles fly comps fast and effectively together with built in airspace avoidance and many other functions for optimising a great XC flight. A pocket sized Top-Nav, this vario/gps has practically everything you could wish for, including the thermal mapping that made the top nav famous! This vario should become the new standard. The 'mission control' of varios. Designed to help you win competitions, it does exactly what it say's on the tin!